A group of passionate artists want to do something for those who do not have the opportunity to enjoy creativity. How can we let them share and enjoy our talents? We would like to give children an unforgettable creative experience. Right where they live often under traumatic conditions. IT DID NOT STOP WITH DREAMING ABOUT IT. Wil van der Weele started the organisation in december 2001. The artists packed their bags. Collected paint, brushes, paper and all kinds of materials to set out for the first project in Romania. We worked with, poor, sick, abused children, streetkids , orphans, warvictims. Local staff was thrilled when they saw the activities. As a result they organized new projects themselves. Through different contacts like World Vision, Ywam, Warchild, SOS, Save the children and individual churches and initiatives, we received invitations to come. For instance in the project “SKY AFTER THE RAIN” with aids orphans in Thailand. Ex child soldiers in the shelters and refugee camps in Northern Uganda. 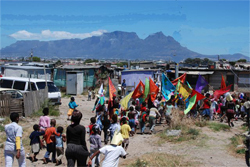 Kids living in the townships of Cape Town. Time after time it is so special to be able to work with kids so intensely. We work and play with them and try to build up their self- esteem. Help them to trust again. Bringing hope and expectation through creativity. It is not about the artwork itself. The process is more important than the result. It is fantastic to see what kids can create with a little guidance and stimulation. Art for All wants to face that challenge head on. No competition, but experiencing fun together. The Art for All team members do not consider themselves therapists, but know that the specific things they do are very therapeutic. A staff member of the rehabilitation center in Uganda said:” We never expected the girls to participate that much. They do not like painting and drawing. The art work made by the children is for them. It is not being sold. The projects take about 3 weeks. We always end with a big parade. A procession with music, happy and proud children. Lots of color, self made flags, banners with the VILLAGE OF THEIR DREAMS. 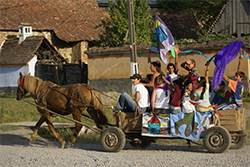 The parade is often an inspiration for the entire community. World wide the foundation Art for All wants to be the translation of the heart of God. With laughter, joy and inspiration, kindle new hope to be able to face the next day for young and old. In a practical and creative way we try to help turn the tide in broken and desperate lives. The Creator is our source of inspiration. psychiatrist at the clinic for child psychiatry in Leuven LUK, Gasthuisberg and lecturing at the Roman Catholic University Leuven KUL (Belgium).